If you are one of those people like to read magazines, this is the post for you. 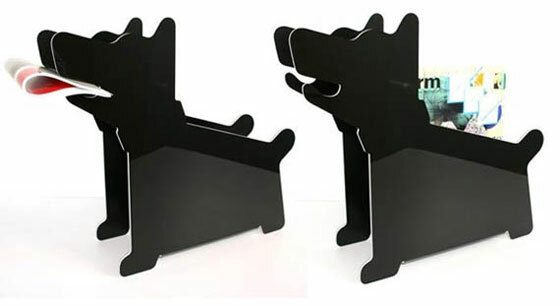 Rather than stacking them in a corner or tossing them in a bucket, why not display your monthly prints in one of these sleek magazine holders. 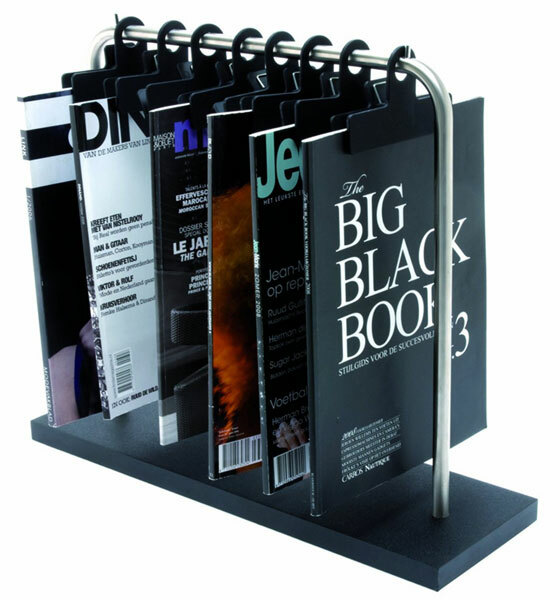 Creative holders, stands and racks that store your newspapers and magazines add style to your living room, and are sure to attract and impress your guests as well. 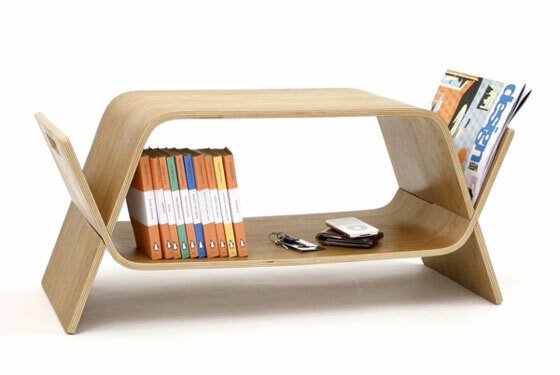 A flexible side table that stores your magazines while providing a surface for a cup of coffee or an extra seat. When it’s time to check email, flip this table on its side and it transforms into a laptop stand. 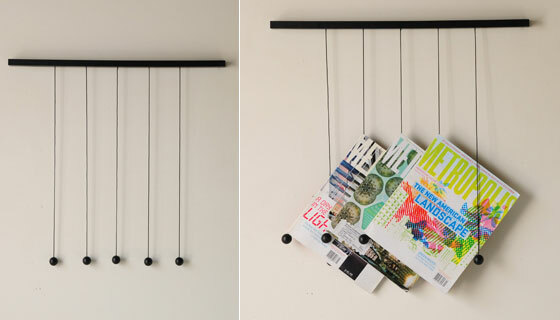 This design allows you to display the magazines you’re currently into on the wall like a coat rack, with the string and the ball at the end holding them up for easy access. Too Big to Fail, Too Big to Save. 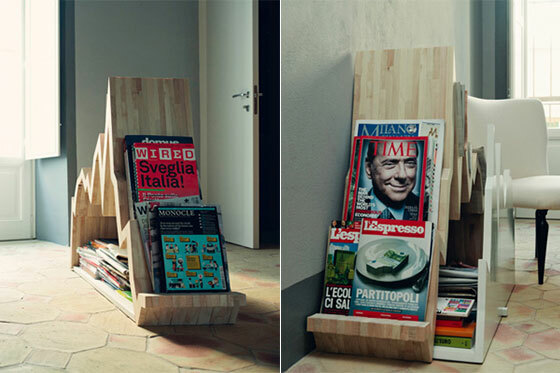 Spread 10Y is a handcrafted wooden magazine rack designed to combine the “news” with the now “(in)famous” graph. It also maps the transition between the Silvio Berlusconi government and that of Mario Monti. 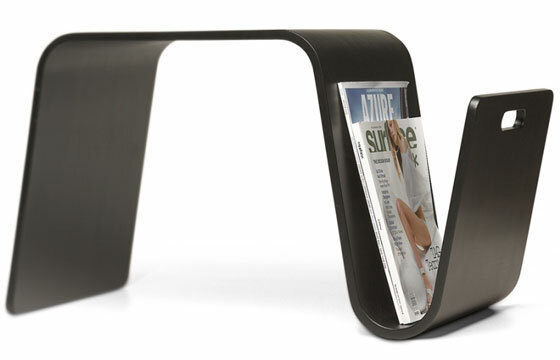 With its ingenious anti-clutter design, the Illuzine magazine rack from Umbra is a clever storage solution for stacks of magazines, catalogs, or newspapers around the house. 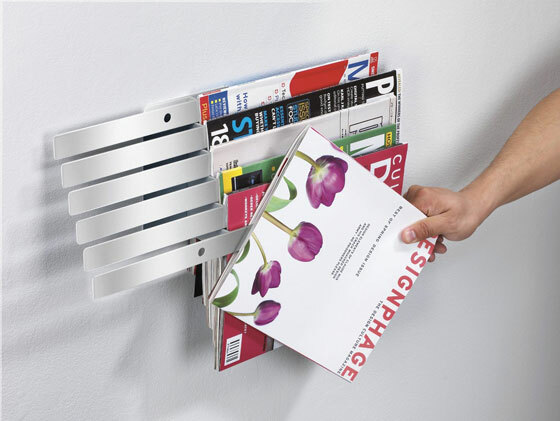 Mounted to the wall, this sturdy metal rack conveniently stores media draped over its twelve flat bars. The rack itself is instantly concealed beneath its tidy contents, giving an illusion of floating that is sure to please any minimalist. The slim, space-saving profile is perfect for bathrooms and other tight spaces. 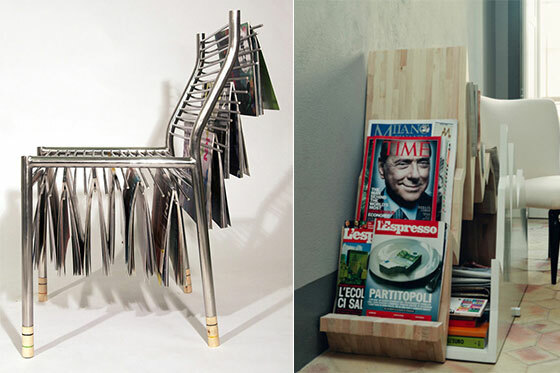 Rails of stainless steel built into the chair act as individual hangers for various publications. Each magazine can be easily grabbed, without having to get up. It might not look too comfortable, but the idea behind is creative and fun. 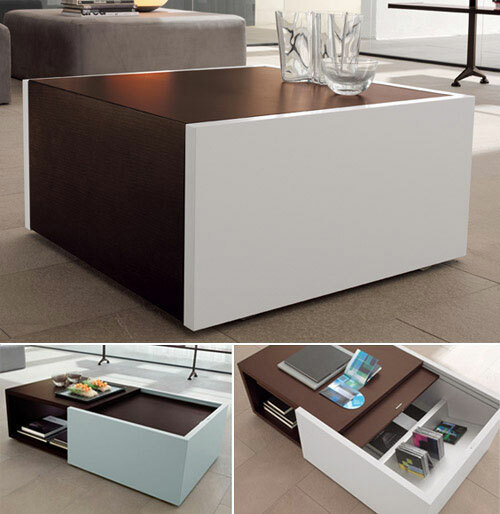 Low table that extends and changes its shape by doubling in size revealing generous storage for magazines, books, CD and DVD. Clean lines, functionality and diverse wood and lacquer finishes combination between wengé stained oak and white lacquer. This hanging rack meets all the requirements of the loft-owning glitterati: brushed anodized aluminum with a flowing, organic shape. 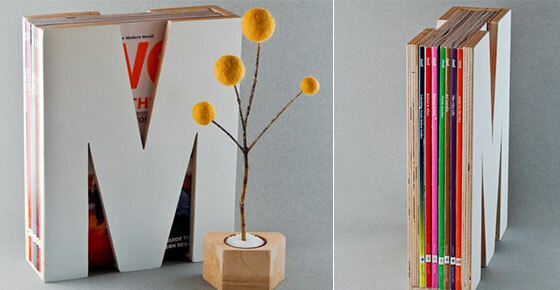 Magazines must be folded to fit, but this Gehryesque flourish could just as well stand alone on your wall. 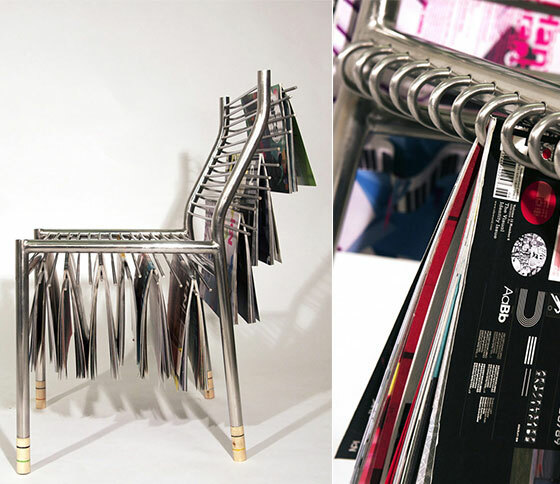 Inventive magazine rack to avoid your personal magazine chaos in your livingroom. Poppy obeys to your words. He almost brings the newspaper to your armchair, because he can carry a newspaper or magazine in his mouth! Funny and a real eyecatcher. 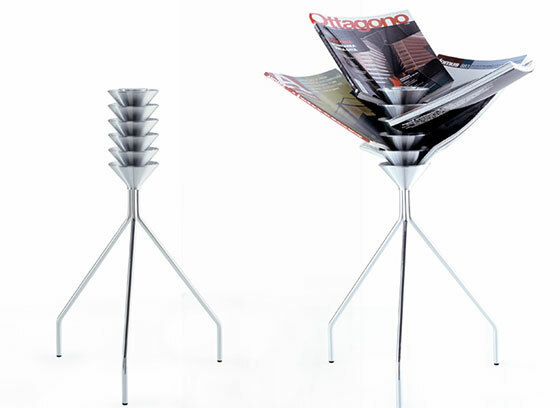 Inspired by the fluttering pages of a newspaper on a windy day, the Kartell Front Page Magazine Rack was designed by Swedish design team Front to add a sense of lightness and elegance to the task of arranging reading materials. This dynamic semi-circular shelving unit is made out of vibrantly colored transparent or batch-dyed polycarbonate.Kartell, headquartered in Italy, creates superb products through its commitment to project, design, and technological innovation. 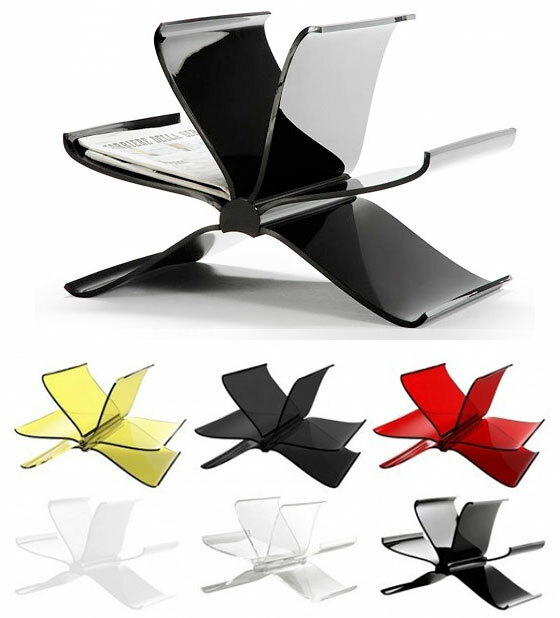 HOI magazine chair by Dutch designers, Jules & Jeremy is one easy chair that helps you sit on and hold your magazines too. Made up of the MDF finish with mat white lacquer, this hip chair measures 116 cm x 86 cm x 73 cm. I like the chair for now I can free some of my magazine collection from those bulging bookshelves and instead sit on them. 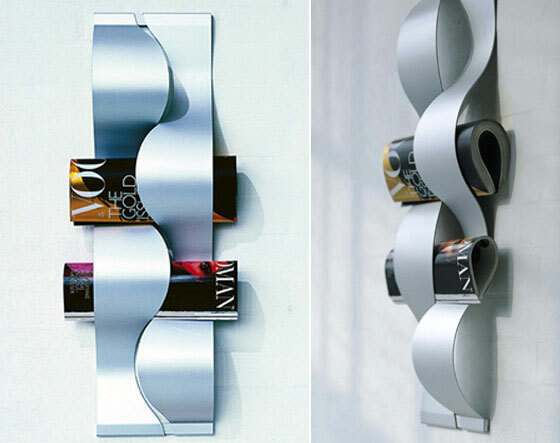 Omero is an unexpected three-legged magazine rack in mirror polished aluminium and stainless steel. Born out of the observation of the gesture of holding a magazine in the hand; the natural position of the fingers makes the magazines curve slightly, which structure and therefore facilitates the control of the movement and the weight. This subtle curve gave shape to a series of simple modular cones made of aluminium, which hold the magazines that fit perfectly and easily between the rings. This creative modern metal design allows you to hang eight or more of your most glam ‘zines, so you can display and find them like couture on a clothes rack. Comes with 8 contemporary clips. Instantly gives your living space a designer aesthetic. One outside face is painted bright white, while the other outside face is unpainted, exposing the natural beauty of the baltic birch veneer. Holds approximately 5-10 magazines. The original brief was set to design a modern take on the Isokon Penguin Donkey, that was within 10% of the originals dimensions. The outcome was “embrace” an award winning piece of furniture, designed to store modern media such as DVD’s, CD’s and Magazines.